As I have ASPX-sites as well as PHP-websites, I run both flavours on my webserver IIS 10 on Windows 10 prof 32bit, latest update. That seems to give no problems, but the last few months I have many crashes of my PHP-sites. I can trace these crashes and hanging of sites to FastCGI problems. Recently, my websites running (on the same 32-bit IIS webserver) under PHP version 7.1.7 crash many times (Internal Server Error 500), or are 'frozen' in a process (Loading data...) which does not end. The Internal Server Error is traced back to a FastCGI problems/failures: "FastCGI exited unexpectedly". Sometimes, refreshing the browser-window (F5 or ctrl-R) helps, but often I have to restart my webserver entirely (hard-reboot). "HTTP Error 500.0 - Internal Server Error. The FastCGI process has failed frequently recently. Try the request again in a while." Clicking in album categories of Piwigo and on individual photo's for detail-page cause the same FastCGI error message. This happens especially when handling GIF-animations, which are resized on the fly by the Imagick-plugin. (The website also contains the PicLens 3D Wall plugin [Adobe Flash]). This may work with: Microsoft Visual C++ 2015 Redistributable (x86) - 14.0.23026 , but often results in 'frozen' webserver. The statistically calculated content of the Piwigo-site (visitor activities) is often blanc in Piwik detail-pages, and sometimes filled with appropriate data. Overal performance: these PHP-sites have become slow and unpredictable. Do you know what could be the main cause of this FastCGI problem? regarding versions of: Piwik, Piwigo, Imagick, Visual C++ Redistributable, PHP - FastCgi ? Or may the cause be: recent updates / upgrade of Windows 10 this year? b) Relevant content of: php_imagick-3.4.3rc4-7.1-nts-vc14-x86.zip (PHP-extension). First of all, you need to check whether both application pool identity(IIS Apppool\<apppoolname> and authenticated user like IUSR has the read/write permission to access the files. Secondly , you could try to grant permission to the c:\windows\temp. You could use php -v to check whether the PHP configuration has been configured correctly. If the steps above not working, maybe it is not an IIS fast-cgi configuration error but an application error in IIS fast-cgi pipeline. So maybe you need to check your PHP code or consult the PHP forum. Thank you for your answer and advice. A. About IUSR: I thought this IIS-user is obsolete/deprecated in Windows IIS 10. ASP.NET, IIS_IUSR, IIS_WPG, and IUSR, but no Windows-users with the name of a site, generally: IIS (Apppool\<apppoolname>). But all these sites do have a Windows user-profile/account in c:\users\ !?! B.a) I have tried, though, to initiate IUSR rights to my Piwigo-site from top-level folder and all sub-folders (parent/child + files: Replace all child permissions...). This led to many 'Access denied' message-boxes regarding all kinds of files within this website (sub)folders. Read & execute+, List folder contents+, Read+, Write+ . One of these IUSR-rights seems to have a slight beneficial effect on the Piwigo-site: less errors (HTTP Error 500.0), but not completely resolved. b) I gave the same rights to my Piwik-site (also many 'Access Denied' on child-files). The result on this site is that the information on particular site-entities is still not updated properly (Continous message: "Loading data ..."). C. I also gave IUSR these same rights (see above) to: c:\windows\temp . D. And I gave IUSR rights on: ..\PHP\v7.1\php-cgi.exe: Read+ , Read&Execute+ . HTTP Error 500.0 - Internal Server Error : ..\PHP\v7.1\php-cgi.exe - The FastCGI process exited unexpectedly . I still have no clue what exactly causes the problem: PHP v.7.1.7, CGI, Fastcgi, Piwigo, IIS 10 or Windows 10 update (Creator Fall), or collaboration of Windows with Open Source components. That DLL is a Windows / IIS product ? I think it may not be an IIS issue, you may need to analyze something like asp.net dump file. Then it should point you to the right place. PHP forum should be available for this. 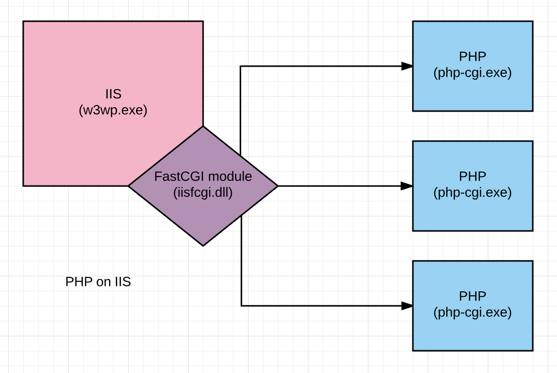 Regarding solving FastCGI problems: the fact is that the PHP-forum points to IIS-forum, and the IIS-forum points to PHP-forum . If you do observe a crash on iisfcgi.dll, open a support case via http://support.microsoft.com to see whether there are patches for that.